If you aren't the server admin, the [ ban ] option will not appear. 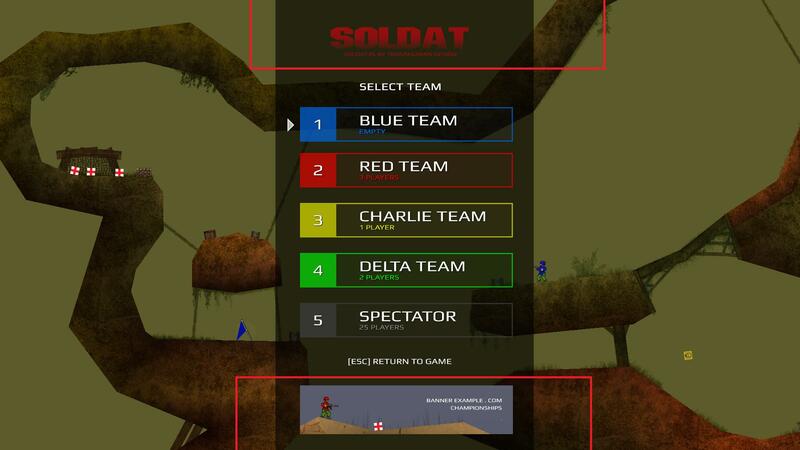 Nice idea mate, I think something like that would improve soldat somewhat. Awesome, love it! I'm not a fan of kick/ban menu though, I think instead of having to switch pages left/right there should be a vertical scrollbar instead. The vertical scrollbar is perfect but more difficult to develop, or not? What I've always found bothering to be missing is ingame access to controls/player/server menu, you can't configurate your settings without quitting a match. Good! I'll draw something about this but I don't know if it's possible to develop without a lot of work(as a year to build). Another suggestion: Pressing ESC will automatically hide all elements(messages, FPS, kill log, interface...) This could give us space to create new and better menu interfaces. 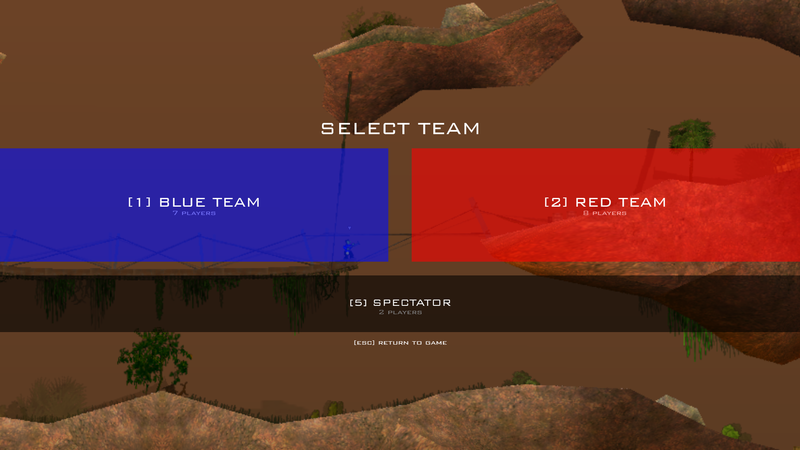 how about spectatot button with double height? maybe highlight current open submenu item in esc menu? What do you use to edit the images? 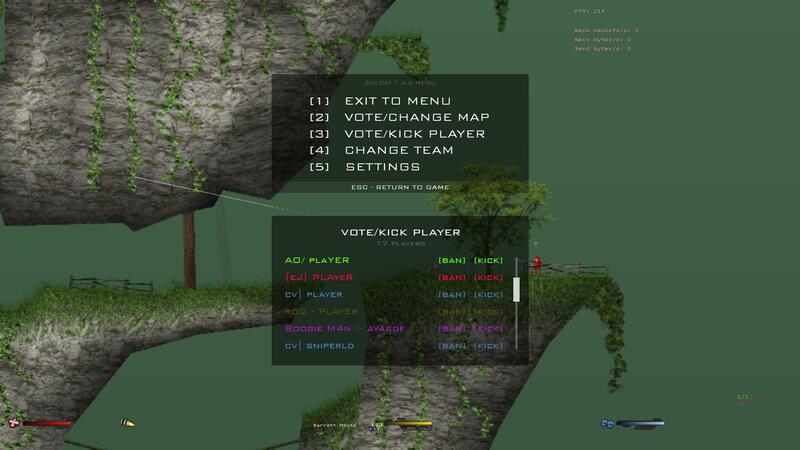 + it would be nice if after pressing Esc, cursor would be automatically positioned in center of this menu(or screen). Sometimes when you have play in high-res or you use different cursor it pain in the a$$ to find it when you push Esc. I did couple changes that you suggest, but feel free to edit the .psd file and/or build this in game. -Shouldn't it say Alpha Team and Bravo Team? Not even sure I like the coloring of each player. 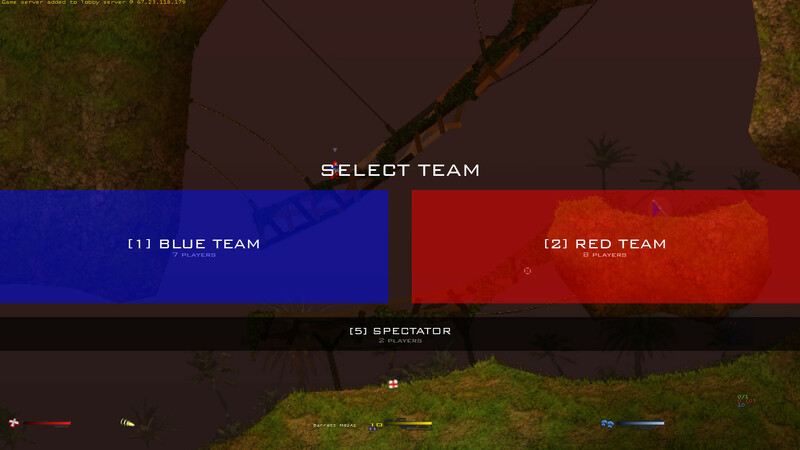 -Is it necessary to have the ''Select team'' headline? 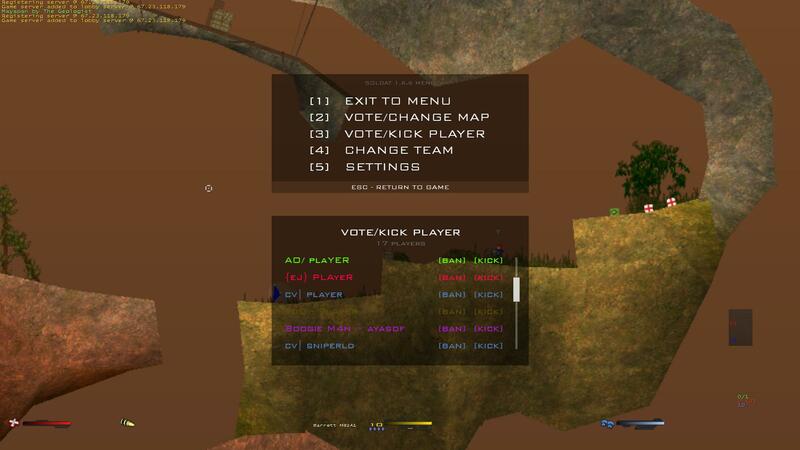 You could instead move ''[ESC] Return to game'' to the top. I hope this will be added in time! - ofc, its just an example. - yeah, you're probably right about the "select team" and "[esc]..."! - hahahhaha for sure! it's terrible and the same with the weapon menu! I'm playing with 1080p and getting mad all the time chasing the menus! I don't have Photoshop, if I do gfx or mockup stuff i use GIMP, MyPain, Krita, Paint.NET/Pinta or The Pencil Project. I can import the psd in Krita but the text cannot be edited. What font did you use for the text (also font size)? about topic: forget about ban/kick menu its not like everyone use it every 5min. its should be as a menu button just to not encourage trolls to kick everyone. psd files are not fully supported by any tool except photoshop itself. The size of the texts doesn't matter. You will get the right size when typing etc. 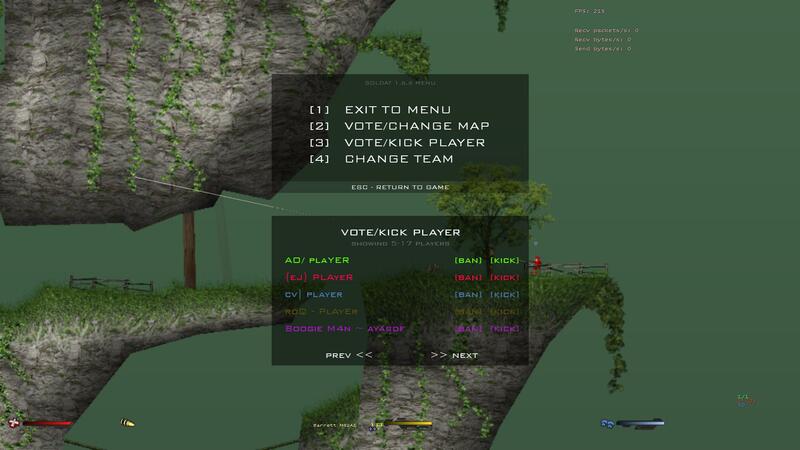 duz, you should try giving a weapons menu a facelift too. It could really use one. Shoozza, you will use this? I think there is a need for more mockups. 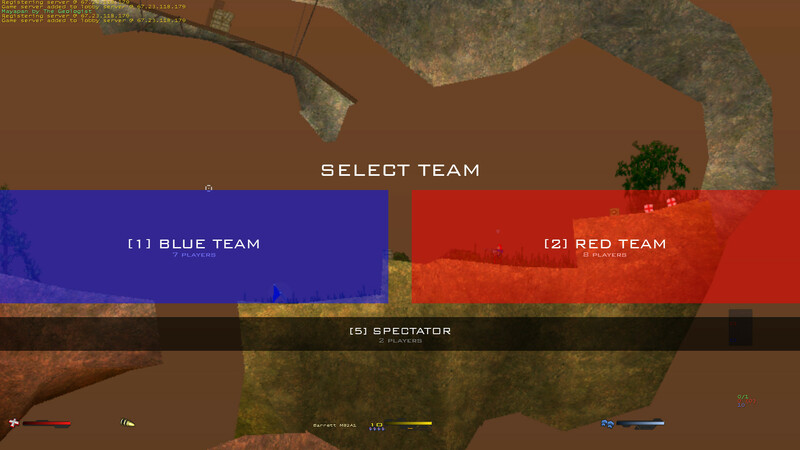 For example how would it look like for TDM with 4 teams and spectator? How does a hovered menu item look like? How does a selected menu item look like? How do the vote/kick menu look on 640x480? Since there are now more mockups they all should work and look similar. On the F1 Menu (score menu) there are no scrollbars (page up/down is used to scroll). I would also make the text about the player count larger. Should I update the mockups? If yes, post some feedback. 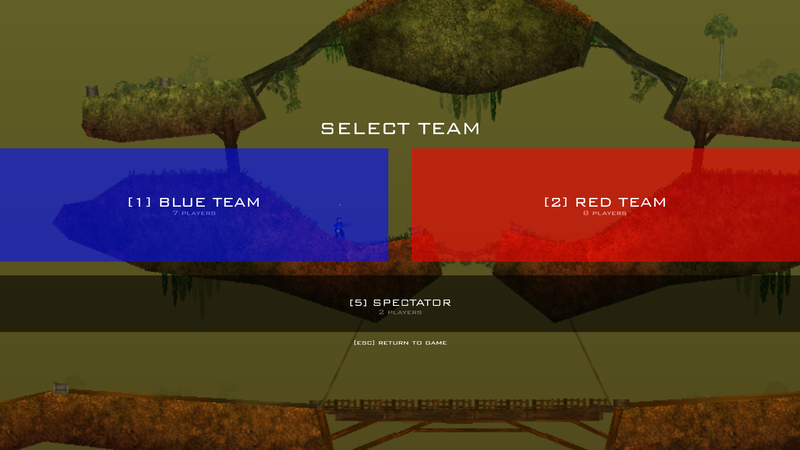 You could try with less saturated colors, because(for me) they are just to... punchy for soldat. And keep the colors punchy. That's one of the reason it looks nice and modern. However, I'm on Akinaro's side regarding the colours. A bit less saturated would be better IMHO. Apart from that, great job. Would be great to see this introduced with 171. A bit more saturated and a punchy color for the selected team. Sounds a good solution whereas (the right word? :/) Shza asked me about an effect for the selected team. Page created in 0.725 seconds with 18 queries.